There is an influx of investors from China, Hong Kong, Japan, Singapore and South Korea buying residential properties here, says PropertyGuru.com.my head of marketing Jason Thoe. They are buying the properties for their own stay or as an investment, and their targets are Klang Valley, Penang, Johor and Sabah, he said. There is concern now of rising property prices. In the last two to three years, property prices have risen by 10 per cent to 30 per cent, mainly in Kuala Lumpur and Penang. The myth faced by the property sector is complaints of houses being overpriced because of higher foreign ownership and speculation. majority are located in the Kuala Lumpur city centre. “That is not going to change anything. 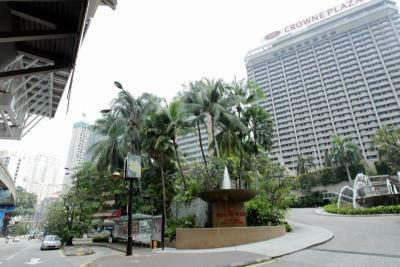 Foreigners are still buying properties worth over RM1 million. They are buying because they have the money,” Thoe told Business Times yesterday at the launch of PropertyGuru’s property showcase. On the outlook for 2013, he said there will be higher transactions for properties priced below RM700,000, especially apartments and condominiums. brands will have a good following. Thoe said Iskandar Malaysia, George Town and Kota Kinabalu are also experiencing higher property transactions. “Property prices in Kota Kinabalu have been increasing steadily in the last 10 years. Developers there are launching properties priced around RM1,300 per sq ft, almost on par with Petaling Jaya. The buyers are mainly Sabahans,” he said. 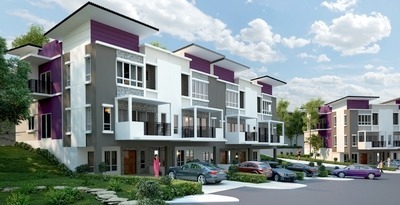 Land & General and Naza TTDI whereby properties are priced between RM400,000 and above RM1 million. 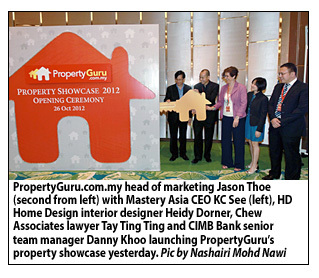 This is PropertyGuru’s second major property showcase for the year. The first was held in Penang last week where seven developers generated a combined sales of RM14.2 million from the three-day event. The past couple of years, in tandem with the rise in property prices in major towns and cities in the country, Kajang's property market has generated quite a bit of interest among both developers and house buyers. Located about 20km from the city of Kuala Lumpur, Kajang is benefiting from its second-tier location status as Kuala Lumpur and Petaling Jaya prices move beyond the affordability of ordinary salaried workers. Two property negotiators based in the area say much of the interest of late is due to improved accessibility with the various highways that have been completed, and not so much because of the soon-to-materialise MyRapid Transit system (MRT). Says one of them who declined to be named: “The spike in prices in Cheras properties has resulted in people from Cheras buying into Kajang as housing is cheaper over there. 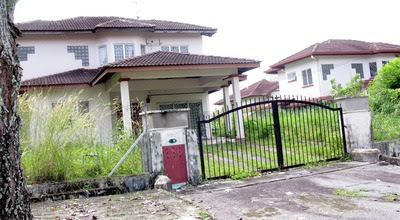 Unless it is very old and run-down, it is not possible to buy into Cheras with RM500,000 and below,” she says. The other factor is schooling. Yu Hua Kajang, which offers both Chinese primary and secondary schooling, will only consider applications from a Kajang address, she says. She adds that projects in that vicinity by the Naza TTDI group have received good response from buyers and investors. As for Kajang-based developers MKH and private developer TLS Group, she says the Kajang and Cheras population are familiar with both. She says the issue is not so much a lack of housing, but the scarcity of bread-and-butter double-storey housing. “Developers, in their search of higher profits, are building three-storeys housing, semi-detached and bungalows in Kajang. What people really want are double-storey terraced housing,” she says. Because of the challenges in getting land in and around Kuala Lumpur, developers are also scouring other towns and Kajang seems to be within their radar. Three developers who have bought land in or close to Kajang include Mah Sing Group Bhd, SP Setia Bhd and the Dijaya Corp Bhd. The Sunway group has moved into that location several years earlier. These newcomers will be competing with developers who have built a strong following over the years. Chen: ‘Improved rail transport will benefit MKH’s new developments like MKH City, MKH Boulevard and Kajang 2’. Chen says that at the marketing level, the mid-sized developer, formerly known as Metro Kajang Holdings Bhd, has a strong reputation there, having built 30,000 units ranging from residential to commercial properties over the years. Financially, having accumulated land at between RM8 and RM9 per sq ft would put it at a great advantage compared to newcomers who have paid considerably more. In areas like Semenyih, some of its land bank was acquired at less than RM5 per sq ft. The third factor is the RM135mil turnkey project comprising about 550 acres in Puncak Alam, Selangor, with Puncak Alam Resources Sdn Bhd, he adds. Over the next seven years, MKH plans to build projects with an estimated gross development value (GDV) of more than RM5bil. 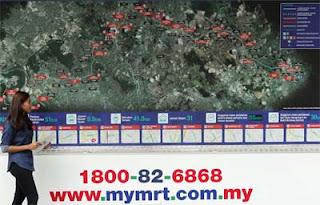 As a result of the Sg Buloh-Kajang MyRapid Transit line, MKH is tweaking its plans for some of its commercial projects. The 51km Sg Buloh-Kajang line will have two stations in Kajang. One of them will be sited at the town centre, about 500 metres from the police station, which is next to MKH City. The second MRT station will be located along Jalan Reko at the Sekolah Menengah Kebangsaan Jalan Bukit. MRT will provide additional public rail transport to the current Keretapi Tanah Melayu (KTM) line. There is also a proposal to have a KTM station next to Kajang 2, another MKH project. Improved rail transport, says Chen, will benefit the company's new developments like MKH City, MKH Boulevard and Kajang 2. It will also give a boost to its older projects Plaza Metro Kajang and Metro Point. Chen says the value of Plaza Metro Kajang will be enhanced considerably as the station will be about 400 metres from it. The company is also considering building a walkway to connect to it. “We had wanted to built a small complex on one of the new sites with a gross area of about one million sq ft. With the MRT line entering Kajang town, we are now considering doubling that to two million sq ft because the MRT line will take care of parking issues,” says Chen. The line will pass close to MKH's new and existing properties MKH City, MKH Boulevard and Kajang 2. Chen says the company has between 500 and 600 acres of land, with the bulk of them in Kajang and Semenyih, excluding its 550-acre turnkey development in Puncak Alam, Selangor. Semenyih is about 10km from Kajang. Besides its base in Kajang, MKH also has projects in Petaling Jaya, Old Klang Road and Kuala Lumpur. On affordable housing, the current buzzword in the property industry, Chen says its projects in Semenyih are priced at between RM300,000 and RM400,000, which is today categorised as affordable. Kajang double-storey housing, by comparison, are now priced about RM500,000. MKH's nine-month earnings for financial year 2012 has risen 124% year-on-year to RM47mil, driven mainly by successful key projects in Kajang, Semenyih and Bangsar. A HwangDBS Research report says the three locations collectively achieved a commendable 77% take-up rate. MKH’s Sentosa Heights project in Kajang. MKH Boulevard: This will include high-rise development on four acres of leasehold land within Kajang town centre comprising 308 units of serviced apartments and 30 units of three and six-storey shop offices with a total gross development value (GDV) of RM172mil. The target launch is next year. ● Kajang East Township in Semenyih: A 135-acre township that is yet to be developed. It will offer 770 units of residential comprising terrace housing, semi-detached and shop offices with a total GDV 600mi. The target launch is between 2015 and 2016. ● Reko Avenue: A high-rise residential development located on six acres of freehold land close to the proposed MRT station and near Kajang 2 township. It will comprise 576 units of serviced apartments and 41 units of two, three and five-storey shop offices with a GDV of RM180mil. The target launch is between 2017 and 2018. ● Kajang 2: MKH's flagship town which will comprise 5,000 units of mixed commercial and guarded development, as well as strata developments with an estimated GDV of RM2.6bil to be developed over seven years. 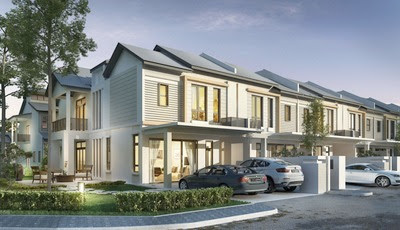 So far, two-storey terraced housing and semi-detached units with a GDV of RM116.6mil have been launched. As of June this year, it has sold 95% of its units. There are plans to have 32 units of three-storey bungalows, 242 units of 2-storey superlink housing, and six blocks of serviced apartments and 20 units of three-storey low-rise villas. The KTM and MRT station next to it is expected to further boost assessibility. Currently, only 50 acres of its 273 acres have been developed. 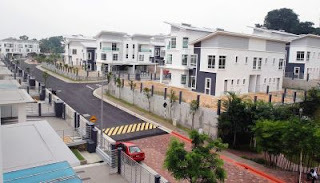 ● Hill Park Homes, Semenyih: About half of its 200 acres have been developed. As of June this year, close to 100% of its properties comprising 1,400 semi-detached, two-storey terraced housing have been launched. There are plans to launch double-storey housing, semi-detached units and 10 units of shop offices in three years. MKH has other projects in Melawati, Bangsar and Semenyih. A developer who wants to build on the RRIM land will have to first convert it to development land. INCREASINGLY, the number of new developments being advertised and marketed of late are located further away from Kuala Lumpur closer to Rawang, Cyberjaya and Putrajaya with the projects undertaken by some of the larger Bursa-listed property developers. 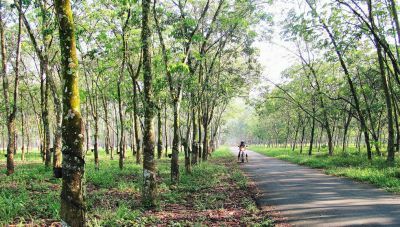 The trend of such developers moving into periphereal locations started a couple of years ago due to the scarcity of large pieces of land between 50 acres and 100 acres close to or in the city which explains why there is so much interest in the Sg Buloh Rubber Research Institute of Malaysia (RRIM) land. If the core business of a company is property development, then land is virtually gold to them. Without land, they will not be able to develop anything which means no sales and no revenue. This is why, every year, developers have to launch new projects. The replenishing of land bank has be to be done consistently and constantly, unless they already have a large land bank. This objective to have steady revenue year after year can be a challenge when there is a property downturn, which also explains why it is extremely important to avoid a property bubble. In the last several years, developers have had multiple launches in order to cater to demand. The need to show a consistent stream of income may explain why some of our larger developers are also involved in the plantation sector. Plantation land can be converted into property development if and when the need arises. Besides the availability of land, the next important issue is land price. Some of the larger players which have purchased land in the Kajang, Semenyih and Bangi areas over the last couple of years include S P Setia Bhd, Mah Sing group and Dijaya Corp Bhd. Last year, S P Setia bought 272.5ha, or 672 acres, of freehold land in Semenyih for RM381.26mil or about RM13 per sq ft.
A couple of years ago, Dijaya bought the 200-acre Kajang Hill Golf Club for RM228mil or about RM26 per sq ft. The price a developer pays for his land is important because at the end of the day, this will be reflected in his selling price. Mah Sing Group Bhd is the other new player in the Bangi area. In May, it bought about 400 acres in Bangi for RM333.25mil or about RM18.50 per sq ft. When a developer buys land that is not slated for property development, there is conversion cost. For example, if a piece of agricultural land is bought for RM10 per sq ft, it has to be converted into land for development. The land office will consider the price of other development land in the area. If the market price is RM20 per sq ft, there is a difference of RM10. The developer will be charged a premium of 25% of RM10 which is his conversion cost. That means, in order to change the land status from agriculture to development land, he will have to pay an extra 25% multiplied by his land size. There are various factors that determine the cost of conversion. A developer who wants to build on the RRIM land will have to first convert it to development land. There is a different price range for commercial and residential land, with commercial land being more valuable. Apparently, Mont'Kiara land is already between RM600 and RM700 per sq ft, and the Tropicana land is RM200 to RM300 per sq ft.
Because some parts of RRIM land is next to Tropicana, when the land was parcelled out, the price may be rather prohibitive to smaller and less capitalised property developers. Considering that large-scale developers have been land-hungry and have been buying into places in Semenyih, Kajang and Bangi, and the RRIM land being far more strategic, it is hoped that the Government, by virtue of the fact its cost of funds is cheap, will parcel a considerable portion of it for affordable housing. The Government could also help by releasing other land under its plan to provide affordable housing for the people but as it stands today, it may, in all likelihood, also be further away from the city with places like Kajang, Semenyih and Nilai mentioned, among others. Deputy news editor Lee Cheng is of the view that housing issue can become a social problem if not dealt with expediently. KUALA LUMPUR: Permodalan Nasional Bhd (PNB), Malaysia's biggest fund manager, is planning to buy more prime commercial properties in major cities. "We are also looking at other markets. We can't say where we are going to invest next as this could prop up prices but we will make an announcement when it is a done deal," said its chief executive officer Tan Sri Hamad Kama Piah Che Othman. Hamad was speaking on the sidelines of the signing of memoranda of understanding between Tun Ismail Mohamed Ali Foundation (YTI), a foundation set up by PNB to promote tertiary and professional education, and two local universities to enhance academic excellence. He was responding to a question of whether PNB is looking to buy more prime office space in London, where it has gone on a buying spree in the past year. So far, the state-owned fund manager has sunk in more than RM5 billion there. Its first investment in London was in December 2011 when it bought a 12-storey office space in Milton & Shire House on 1 Silk Street for STG350 million (RM1.72 billion) from American investor Beacon Capital. In January, it bought Woolgate Exchange on 25 Basinghall Street, a nine-storey commercial office with a basement floor, for STG270 million from Irish development and investment company D2. Two months later, PNB bought two more office buildings - 90 High Holborn and One Exchange Square - from German fund manager KanAm for STG550 million. One Exchange Square is tenanted by the European Bank for Reconstruction and Development, a quasi-public organisation, while 90 High Holborn is the headquarters of law firm Olswang. 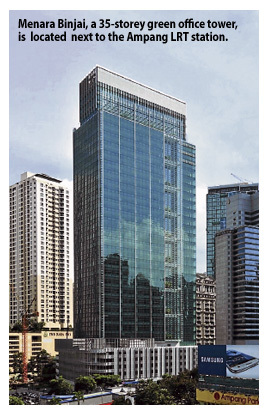 PNB's first foreign foray was back in August 2010 when it bought Santos Place in Brisbane, Australia, for A$290 million (RM916.4 million) from Nilson Properties. The 37-storey building has 373,508 sq ft of lettable space with about two-thirds of that leased to Santos, an Australian oil and gas giant. PETALING JAYA: Bolton Land Sdn Bhd, a wholly-owned subsidiary of Bolton Bhd, has purchased two parcels of freehold development land off Jalan Segambut, Mont’Kiara in Kuala Lumpur for RM4.4mil. In a filing with Bursa Malaysia yesterday, Bolton said its unit has entered into a conditional share sale agreement for the proposed acquisition of 1,000 ordinary shares of RM1 each. representing the entire equity interest in Seni Buluh Sdn Bhd. “The proposed development of the land would consist of high-rise mixed commercial and residential development, with estimated gross development value and gross development cost of approximately RM250mil and RM200mil respectively,” it said. SINGAPORE: There are interesting times ahead for Malaysian Real Estate Investment Trusts (M-REITs) which is also set to attract new players to the market. Sunway REIT Management Sdn Bhd chief executive officer Datuk Jeffrey Ng said with the success of the listing of M-REITs and the performance track record (total return), the industry will continue to attract new players to it. “We wish to see the entry of REIT players that are backed by size, good quality assets and reputable promoters to grow M-REITs to the top three REITs market in the region. “Currently, the top three REITs markets in terms of market capitalisation in Asia are Japan, Singapore and Hong Kong,” he told Bernama. When asked how he rated the local industry at present and challenges faced by players like Sunway REIT, Ng pointed out that the M-REIT industry is currently in the growth phase. “It continues to attract the entry of not only new but large and quality REIT players as evident from the listing of Pavilion REIT and IGB REIT from the end of last year to date. The market capitalisation of M-REIT stood at RM19.3bil as at Sept 30. “This however, is relatively small, in comparison to the Singapore REIT market,” he said. Ng noted that there were many property companies planning for REITs and this augurs well for the M-REIT industry in the future. “One key challenge is competition. We believe that competition is inevitable and the best approach in managing this is through clearly defined growth strategies with good execution. “We will continue to implement our growth strategies in order to maintain market dominance in M-REITs. Certain sub-sectors of the property market are heading towards more intense competition and over time, it is a survival of the fittest,” he said. As more REITs enter the market, Ng said acquiring new assets with earnings accretive will naturally become more difficult by virtue of the compressed yields. Touching on existing policies, he said the Securities Commission, Bursa Malaysia and the Ministry of Finance have been extremely supportive of the development and growth of M-REITs industry. “The prevailing regulations are accommodative for expansion of the M-REITs industry. For instance, the permitted gearing limit for M-REITs is up to a maximum level of 50%. “In our opinion, the permissible gearing limit is supportive of growth compared to a country like Sinagpore, where the gearing limit is set at 30% (without rating from credit rating agencies). “For larger REITs, the additional 10% gearing limit is meaningful for acquisitions,” he added. SINGAPORE: Ascendas, a Singapore government-linked firm, said on Tuesday it has entered into a joint venture with a unit of Malaysia's UEM Land to develop a technology park in an economic zone that the Malaysian government has been promoting aggressively. The 519-acre (210-hectare) technology park in Iskandar Malaysia, with a projected investment value of S$1.5 billion ($1.23 billion), will cater to businesses in electronics, pharmaceuticals, medical devices, food processing and precision engineering, Ascendas and UEM said in a statement. Ascendas, a developer and manager of industrial properties across Asia, is a unit of Jurong Town Corp, a Singapore government body. UEM's main shareholder is Malaysian state investor Khazanah Bhd. Malaysia has been trying to woo companies to Iskandar, an economic zone in the southern state of Johor that is connected to Singapore by two bridges. KUALA LUMPUR: Daya Materials Bhd has secured a contract to undertake a property project in Penampang, Sabah with a gross development cost of RM120mil. It said on Tuesday its unit had signed an MoU with Chang Cheng Realty Sdn Bhd to build one block of 28-storey retail service suites and also 40 blocks of four-story shop-office and eight blocks of three-story shops. Daya Materials said the RM120mil comprised of the total construction cost and interest. However, the estimated gross development value was more than twice at RM250mil. KUALA LUMPUR: Location is the most important factor where demand for affordable housing is concerned, a property consultant said. CH Williams Talhar & Wong Sdn Bhd managing director Foo Gee Jen said during a presentation at CIMB Preferred’s 76th Financial Advisory Series that there was demand for affordable, but the Government would need to put location at the forefront where such property projects were concerned. “There is always a mismatch when it comes to affordable housing. 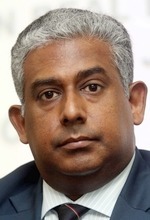 You can’t build 10,000 low-cost units in Bukit Beruntung even if you sell it cheap,” he said. “You cannot expect someone who earns RM1,000 a month to live in Bukit Beruntung and work in Kuala Lumpur. The fuel cost alone will kill him. When I visited Iskandar Malaysia (in Johor), I saw affordable apartments that were ready for occupation priced at RM75,000. I was told sales were only 15%. On the Government’s proposal to defray the cost of infrastructure borne by developers, Foo suggested that rather than providing subsidies, it would be better to limit the number of items that property firms had to contribute to. Prime Minister Datuk Seri Najib Tun Razak had said last week the Government was considering a model to help pay for infrastructure so that developers could sell houses below the market price. “We can come up with a Government allocation to defray the infrastructure costs,” he said in an interview with Chinese radio station Melody FM, adding that developers interested in building affordable homes could approach the 1Malaysia people’s housing programme (PR1MA). He added that PR1MA would be given unutilised government land to build the homes. Foo also said there were many plots of land along the Sungai Buloh-Kajang line of the My Rapid Transit with potential to be developed into sites for affordable homes. These include Kota Elmina near Sungai Buloh and government-owned real estate in Jalan Duta and Taman Suntex, he said, pointing out that they were underutilised in terms of plot ratio and density. On another matter, he said occupancy and rental rates for the condominium market was expected to stay depressed for the foreseeable future due to incoming supply. In the first half of the year, the existing supply of serviced residences and condominiums numbered 22,000 but the average take-up rate in the capital was less than 2,000 units annually, Foo noted. He pointed out that the KLCC area was particularly hard hit with occupancy and rentals heading “down south”. “The year 2008 was the trigger point, and it has never really recovered. Prices are holding up but that does not correspond with rates and occupancy. The optimism is based on recent launches like Golf Villas in Tropicana, Phase One of its RM3.8 billion Tropicana Danga Bay development in Iskandar Malaysia, and the RM1.8 billion Tropicana Gardens in Kota Damansara, Selangor. PETALING JAYA: Dijaya Corp Bhd, well-known for the Tropicana Golf & Country Resort and award-winning clubhouse in Petaling Jaya, is upbeat on achieving record-breaking sales of RM765 million in the current year. The optimism is based on recent launches like Golf Villas in Tropicana, as well as Phase One of its RM3.8 billion Tropicana Danga Bay development in Iskandar Malaysia, Johor and the RM1.8 billion Tropicana Gardens in Kota Damansara, Selangor. Despite global uncertainties and stricter rulings by Bank Negara Malaysia on loan approvals, the company recorded positive sales. When the Main Market-listed developer launched Phase One of Tropicana Gardens on October 12, it achieved 100 per cent sales within 48 hours. Phase One, called Arnica Residence, comprises a block of serviced apartments with 400 units. The units range from the 597 sq ft studio to the 2,700 sq ft penthouse, worth RM230 million collectively. "Tropicana Gardens is purposefully designed to draw on the strengths of the location while offering residents the hallmark of our Tropicana brand of properties. "In light of the encouraging response shown, we will launch Phase 2 of the serviced residence soon," Dijaya deputy managing director Dickson Tan said. The 7.05-hectare Tropicana Gardens is a vibrant urban hub that offers a diverse component of serviced residences, mall, cinema, hotel, offices and SOHO. It is situated at Persiaran Surian and easily accessible via North Klang Valley Expressway, Lebuhraya Damansara Puchong, Sprint Highway and Penchala Link. For 2013, Dijaya is aiming to launch projects worth a combined RM2.3 billion. They include Tropicana Metropark in Subang, W Residence in Kuala Lumpur, Tropicana Cheras, Tropicana Landmark in Kota Kinabalu, Sabah, and its projects in Johor and Penang. In Johor Baru, Dijaya is expecting strong sales from its Tropicana Danga Bay development, and the RM2.9 billion Tropicana Danga Cove. Elsewhere in Penang, Dijaya has a joint venture development with Ivory Properties Group Bhd to develop Penang World City, which is estimated to rake in a GDV of RM9.8 billion. "The projects will launch in several phases, taking more than five years to complete. This means Dijaya is on solid grounds for its targeted sales to exceed RM765 million," said several analysts when contacted. 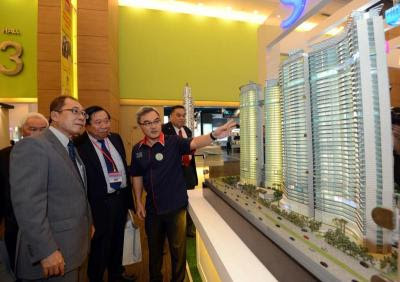 Property project s: (From left) Chor and Mapex organising chairman Datuk Ng Seing Liong listening to a briefing by SP Setia Bhd group president and CEO Tan Sri Liew Kee Sin during a tour at the expo in Kuala Lumpur. 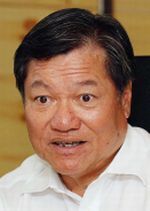 KUALA LUMPUR: Banks should be more lenient towards genuine house buyers who want to get a housing loan, said Datuk Seri Chor Chee Heung. The Housing and Local Government Minister said some banks were too “scared” to approve the loans as they were afraid borrowers would not be able to make repayments. “The banks are being very, very prudent. Sometimes, too prudent that a lot of would-be borrowers don't have a chance to buy houses,” he told reporters after launching the Malaysia Property Exposition (Mapex) 2012 yesterday. While stressing that Bank Negara's guidelines on housing loans were far-sighted in ensuring prudent loan approvals, he also urged banks to be more “considerate”. He said he had also heard of developers complaining that they found it difficult to sell their units as buyers were unsuccessful in obtaining loans. Chor advised banks to investigate the background of each individual applicants to determine whether they were genuine house buyers. On another issue, Chor said he had also noticed several property advertisements placed by developers in newspapers, which were not approved by the National Housing Department. “These advertisements do not comply with the department's requirements, including neglecting to display the advertising permit number or developer's licence in the small print. “I have asked officers to take action against them, and the maximum fine that can be imposed is RM50,000,” he warned. Chor said Mapex 2012 gave potential home buyers the opportunity to get educated about property choices as well as make comparisons from the various offers available. He also urged the Real Estate and Housing Developers' Association Malaysia (Rehda) to follow the Government's lead in building more houses at cheaper prices. Rehda president Datuk Seri Michael Yam said the exposition marketed property of various prices to cater to the needs of house buyers, adding that Mapex had also received very strong support from financial institutions and developers. Mapex 2012 will run until tomorrow at the Midvalley Megamall Exhibition Centre. Artist impression of Bandar Saujana Utama residences. GLOMAC Bhd will be focusing on plans for new landed residential units within its townships of Saujana Utama in Sungai Buloh, Saujana Rawang and Lakeside Residences in Puchong, Selangor for the next 12 to 18 months. “This is what the market wants,” the property developer's group managing director and chief executive officer Datuk FD Iskandar told StarBizWeek recently. FD Iskandar recalls with amusement that about five years ago, he felt there was not enough demand for township developments. FD Iskandar says there is strong demand for landed residential units at selected locations in the Klang Valley priced at RM1mil and below. He also says that in the next two years, 70% to 75% of the group's sales would come from residential units. FD Iskandar points out that the launch of 105 units of two-storey terrace houses with GDV (gross development value) of RM75mil at Lakeside Residences was fully sold through balloting last month. The units, with built-ups of 2,230 sq ft and 2,120 sq ft and lot sizes of 22ft x 75ft and 22ft x 80ft, were priced from RM680,000 onwards. Lakeside Residences, which is a mixed development with a GDV of RM2bil on a 200-acre leasehold parcel, will be the group's flagship project in the next few years. There are plans for about 6,000 residential units to be launched at Lakeside Residences within the next six years. About 20% of the units will be landed homes, with the balance being high-rise units. FD Iskandar says Lakeside Residences is part of Puchong's thriving commercial hub, and the guarded development will also benefit from the LRT (light rail transit) extension line which starts from the Sri Petaling station and passes through Kinrara, Puchong and ends at Putra Heights. The extension is expected to be completed in 2014. The next two phases for Lakeside Residences will also consist of two-storey terrace houses, with 139 units (GDV of RM94mil) targeted to be launched before year-end. Lakeside Residences in Puchong is among the key drivers for Glomac’s sales. This will be followed by the launch of a further 75 units (GDV of RM54mil) next year. Regarding the 1,000-acre Saujana Utama and 345-acre Saujana Rawang, FD Iskandar notes that both the townships have contributed combined sales of RM72mil for the group's first quarter ended July 31. FD Iskandar says Saujana Utama with a total GDV of RM1.4bil had done well since the development began in 1996. This year, the group has also expanded its land bank to tap demand from middle income home buyers in the Klang Valley. In February, the group bought a 200-acre leasehold parcel next to Saujana Utama for RM44mil through a public auction. In June, Glomac bought 192 acres in Dengkil, Sepang from Lee Chin Cheng Dengkil Oil Palm Plantations Sdn Bhd for RM66.8mil. The new parcels in Saujana Utama and Dengkil are expected to have a GDV of RM800mil each. According to FD Iskandar, the Dengkil land would cater to home buyers looking for landed units priced RM500,000 and below. He says the Dengkil land is only three km away from Putrajaya and Cyberjaya, and 2.5 km away from KL International Airport. The development will face the Maju Expressway, and the group has conducted preliminary discussions with the highway concessionaire. For its financial year ending April 30, 2013 (FY2013), Glomac is on track to outdo its record sales of RM663mil achieved in the previous financial year. FD Iskandar points out that the group had achieved new sales of RM212mil for its first quarter ended July 31 due largely to healthy take-up rates for launches at Reflection Residences @ Mutiara Damansara, Glomac Centro in Petaling Jaya as well as Bandar Saujana Utama and Saujana Rawang. Glomac has a pipeline of future projects with a total GDV of RM7bil, out of which RM1.13bil will be launched in financial year 2013. Key drivers for the group's sales in financial year 2013 will be Lakeside Residences in Puchong, Phase 4 of Plaza Kelana Jaya, and the townships of Bandar Saujana Utama and Saujana Rawang in Selangor and Sri Saujana at Kota Tinggi, Johor. “Usually, we hit 80% to 85% (sales of the new property launches). So, I think we should have at least RM800mil (of sales in FY2013),” says FD Iskandar. The group's unbilled sales as at end-July is also at a record high of RM763mil. Reflection Residences @ Mutiara Damansara consists of 299 units of freehold serviced apartments in a 39-storey block, with a GDV of RM270mil. The units are sized from 1,092 to 1,705 sq ft and priced from RM750 per sq ft. Launched at end-March 2012, Reflection Residences has a take-up of 82%. As for Glomac Centro, its phase one consisting of 54 units of two-storey shop offices (GDV of RM117mil) and 344 units of serviced apartments (GDV of RM250mil) was launched in April 2012. The two-storey shop offices, with an average price of RM2.1mil each, has a take-up of 59% while the serviced apartments, with sizes ranging from 1,175 to 1,670 sq ft and priced from RM655,000 per unit, has a take-up of 32%. Meanwhile, at Glomac Damansara, a 25-storey office tower sold en-bloc to Lembaga Tabung Haji for RM171mil two years ago is 62% completed. Glomac Damansara, which sits on 6.8 acres of freehold land, has a GDV of RM950mil and also features 12 units of five and eight-storey shop offices anchored by a 16-storey office block, two towers of residential units, and a retail mall. The residential component consisting of 356 units in two 26-storey tower blocks with a GDV of RM288mil has a take-up of 85% since its launch in February 2011. Its final phase consisting of a 350,000 sq ft boutique retail mall (GDV of RM336mil) is earmarked for en-bloc sale. Glomac deputy chief operating officer Brandon Ong also points out that the group's net gearing is at a comfortable 6%, which gave it the capacity to further increase its land bank when the opportunities arise. As at July 31, 2012 Glomac has fixed deposits, short term placements, cash and bank balances amounting to RM360.7mil. “It is a good time to be sitting pretty. Prices of land are starting to ease a bit. Land owners are more reasonable now,” says Ong. The group has an undeveloped land bank of 1,000 acres, with 90% in the Klang Valley and the rest in Johor. In a recent report, Maybank Investment Bank (IB) Research noted that Glomac's net gearing of only 0.07 times at end-July 2012 provides it with a potential war chest of RM315mil (based on its target net gearing of 0.5 times), which could be used for land acquisition. “It is actively looking for sizeable landbanks in the Klang Valley to ride on the current strong demand for affordable landed properties,” says the research unit. Maybank IB Research says Glomac's recent first quarter results had come inwithin expectations, accounting for 20% to 22% of its and consensus full-year estimates. For its first quarter ended July 31, 2012, Glomac posted a 17.3% year-on-year increase in net profit to RM21mil, while revenue rose 26.1% to RM161.1mil. Hong Leong Investment Bank's research unit says it expects subsequent quarters to be stronger for Glomac, on the back of its record RM763mil in unbilled sales. According to reports, there ar e 177 private housing projects that have been abandoned as at May 31. BUYING property and then selling (or renting) it is often viewed as a good form of investment by many. This is especially the case for strategically-located homes that are either new or have been well maintained by a previous owner. However, sometimes, an abandoned house or even an old, dilapidated one, could be worth investing in. Admittedly, reviving an abandoned house can be a daunting task. But with a little bit of patience, effort and money, the home you're looking to revive could just end up being a diamond in the rough. According to reports, there are 177 private housing projects that have been abandoned as at May 31. Finding abandoned houses is actually not that difficult, as they tend to stick out like a sore thumb! The main issue, however, comes after you've found one, and then need to locate its owner. “One simple way is to ask the neighbours,” says James Wong, director of international property consultants, valuers and estate agents, VPC Alliance (M) Sdn Bhd. Wong: ‘One simple way (to find out about the owner of an abandoned house) is to ask the neighbours’. However, a house could be abandoned for so long that even the neighbours might not know of the owner's whereabouts. “The official way is if the house is within the jurisdiction of the municipality, local council or district council, and to go to the assessment section to check the owner and address,” says Wong. “If the house is outside the jurisdiction of the municipality, local council or district council, then you need to go to the land office to do a title search on the property, which will reveal the ownership of the title. Then, you have to check the owner's contact details and contact,” he adds. But what if the owner is deceased? 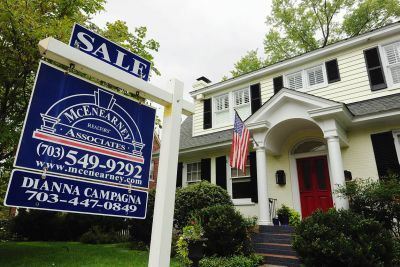 “In a situation where the owner is deceased, one can appoint a lawyer to make checks at the central probate registry at the High Courts to verify whether the family members of the deceased have filed for a petition for a grant of probate (where the deceased died leaving a will) or for letters of administration (where the deceased died intestate),” says National House Buyers Association (HBA) secretary-general Chang Kim Loong. Chang: ‘Checks about an abandoned property could be made at the related land office’. He says checks could also be made at the related land office to ascertain whether an application has been filed (at the land office). Elvin Fernandez, managing director of property consultancy firm Khong & Jaafar Sdn Bhd, points out that abandoned houses, or homes that have deteriorated over the years, tend to be cheaper. He says that the value of a property is affected when the condition of the building has deteriorated. “If the house has been left unattended for a long time or has depreciated quite substantially, then usually the land value remains the same but not the building value. “The greater the depreciation, the lesser the value. In fact, there might actually come a time when the building will have no value at all,” Elvin says. He says in rare instances, the building's deterioration level could be so bad that it could create a spillover effect on the land and affect the land's value as well. “It's not a rule that's set in stone, but usually it's the building value that drops,” Elvin says, adding that even the location of the property could play a role in the property's value. Elvin believes that buying an abandoned house is definitely worth the investment, seeing as these homes generally retail for a much cheaper price (compared with new properties or lived-in ones in the secondary market). Elvin: ‘The value of a property is affected when the condition of the building has deteriorated’. “Abandoned properties could be worth a good buy and definitely a must to look at,” he says. “You have a lot of this going on nowadays, especially within Petaling Jaya. There are a lot of old houses in that area and many people are buying them either to move in or to flip it (resell) for a profit. Siva believes that refurbishing an old or abandoned house is much more cost effective than buying a brand new one (or a lived-in one in the secondary market). “The Malaysian property buyer is such that once he's bought a house, whether straight from a developer or an existing buyer, he's going to tear it down and make renovations of his own. MIEA president Nixon Paul, meanwhile, feels that it's “safer” to buy a house from the primary or secondary market. Siva asserts that although buying an abandoned house and refurbishing it is a good investment opportunity, he does add that it's not for everyone. On a personal note, he does wish that it would be possible for buyers to “pre-customise” their homes when they buy it from a developer, and not purchase a “finished” product that will not necessarily appeal to everyone. “Wouldn't it be nice if the buyer had a choice on the level of fixtures that go into a home, so that the price could be reduced accordingly? Because most people are going to move in and make changes that will end up being a waste of money. “We need to slowly move into a more mature market where there can be more flexibility in the property that we buy,” he says. IMAGINE a cook without his pots, pans and utensils, can he still perform his duties of cooking a delicious meal for his clients? We need essential tools and resources to accomplish our tasks even if we are skilful in our own profession. Same goes to the property industry. With the market demanding more low and medium-cost housing, all stakeholders should look for the most effective ways in maximising the usage of our resources to build affordable housing and to meet the ever increasing housing demand. What are the remedies available? Which parties have the ability, expertise and resources to implement the remedies? First of all, to address the issue of high land cost, the Government could tap onto the expertise of the private sector to develop government land as the land acquisition cost is much lower. Land can be fairly distributed to property developers through open tenders. This way, more homes can be built on a more affordable and effective manner for the people. To increase the supply of affordable housing, the Government should also conduct a study to accelerate the development's approval process by reducing the number of steps and the time involved (sometimes two to three years) in the approval process, have an automatic release mechanism for unsold bumiputra units, and remove the burden of utility infrastructure costs on developments, which should be borne by privatised utility companies themselves instead. In the recent budget announcement, it is encouraging to see that the Government has proposed several measures to tackle the issue of affordable housing in Malaysia. The efforts include the allocation of RM1.9bil to build 123,000 affordable housing units nationwide and a RM500mil fund to build 80,000 houses priced between RM100,000 and RM400,000. People and organisations that work on their areas of expertise are most likely to deliver outstanding results. Government agencies that have been working on affordable housing can build these housing effectively as they have both the expertise and resources. On the other hand, though private developers have the expertise, the challenge of high land and material cost are the main hurdles in meeting the demand, just like the cook without his pots and pans. To meet the desired outcome, it is important for the Government to fund more government agencies with expertise and resources to embark on this initiative. I still recall in 1974, when I joined the Selangor State Development Corp (PKNS) as a director, the main objective of PKNS was to build mass housing for the people and to eliminate the shortage of affordable housing. However, according to a recent article in The Star, PKNS today has also ended up venturing into high-end developments to subsidise its low-cost housing projects and infrastructure, as it no longer receives grants from the Government. This has inevitably distracted the corporation from delivering more affordable housing projects to the public. Therefore, it is important for the Government to constantly revisit the original objectives of corporations such as PKNS and other SEDCs (State Economic Development Corporations), Syarikat Perumahan Negara Bhd, and 1Malaysia People's Housing Scheme (Prima) that have relevant expertise, and continue funding them to build low and medium-cost housing. Generally, people and organisations perform best in their areas of expertise. However, this must be backed with essential resources. If both the Government and private developers can leverage on each other's expertise and resources, I believe we can work towards a more sustainable and affordable housing policy, and realise the rakyat's dream of having their own homes. In that way, the cooks can equip the kitchen with the right utensils to cook up a delicious meal. 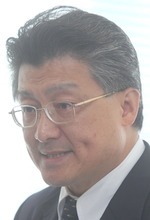 FIABCI Asia Pacific chairman, Datuk Alan Tong, has over 50 years of experience in property development. He was FIABCI world president in 2005/06 and was named Property Man of The Year 2010. 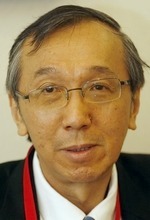 He is also the group chairman of Bukit Kiara Properties. KUALA LUMPUR: UDA Holdings Bhd is among the four government- linked companies (GLCs) spearheading the build-and-sell housing concept. “We’ll be having a meeting with UDA next week. They are scheduled to kickstart this initiative next year,” Housing and Local Government Minister Datuk Seri Chor Chee Heung said. “From now until 2015, we encourage all property developers to adopt build-and-sell. We’re aware there’ll be teething problems as we transition from the current system to the 10:90 concept,” he told reporters here after officiating at the launch of ERA Malaysia real estate business system pilot programme late yesterday. “For one, the banking sector needs to reform the end and bridging financing arrangements with property developers. The build-and-sell concept is more riskier for developers and there’s a chance bankers may ignore smaller ones. We’ll need to address this issue,” Chor said. The build-and-sell concept, already implemented in Australia and Singapore, only requires a buyer to place a downpayment of 10 per cent of the purchase price while the balance is paid after the house is completed. He noted that Islamic banks have so far agreed to provide syariah-compliant financing and undertake construction risks, with installments only commencing after the house is completed. This scheme is meant for houses costing RM600,000 and below. 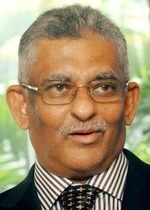 Early this year, Chor said the government had tightened laws through an amendment to the Housing Development Act (Control and Licensing) 1966 (Act 118). Among others, the deposit was increased from RM200,000 to 3 per cent of the cost of physical development, including professional fees for the Housing Development Account, and a maximum penalty of RM50,000 has been set compared with RM20,000 previously for offences under any provision of Act 118. Asked if the government is offering incentives for property developers, Chor said: “For build-and-sell properties, we can waive the deposit. There’s also a dedicated green lane for faster approvals”. KUALA LUMPUR: MK Land Holdings Bhd is upbeat on the real estate market and is planning to launch exclusive hilltop developments and commercial projects in prime locations to meet demand, its key official said. According to group chief executive officer Lau Shu Chuan, the hilltop developments will feature luxury bungalows and town villas. MK Land currently has nine projects in Selangor, Perak and Kedah. Its flagship project is Bandar Damansara Perdana, a 303.5ha township development in Petaling Jaya, comprising landed commercial and residential properties. The Damansara Perdana project is expected to take another 10 years to be completed and is destined to be a premier centre for business and living in Petaling Jaya. Lau said Damansara Perdana is currently one of the biggest developments in Petaling Jaya, with sales of RM2.82 billion derived from the launch of condominiums, high-end apartments, a range of commercial buildings and semi-detached bungalows. MK Land is planning to launch new phases at Damansara Perdana, Lau said after handing over keys to its buyers for its The Rafflesia @ Park project last week. The new phases include The Rafflesia @ Hills and The Rafflesia @ Peak, featuring semi-detached bungalows, he added. The Rafflesia @ Park, meanwhile, is a residential project with prices ranging from RM2.6 million. Lau said the development is expected to be completed by June 2014. MK Land is offering a five per cent discount to buyers, with no legal fees on SPA and loan documentation. KUALA LUMPUR: Menara Binjai has emerged as the first Malaysian building to win the Cityscape Awards for Emerging Markets 2012 for the Best Sustainable Development Award (Built). Designed by award-winning Malaysian firm Veritas Architects, Menara Binjai, clinched the top spot in the coveted sustainability category, beating two other finalists; the award-winning UAE Pavilion in Abu Dhabi by Tourism Development and Investment Corp and Masdar Institute of Science and Technology (M.I.S.T) by MASDAR. Both buildings are designed by Foster and Partners of the UK. The award ceremony was held on October 3 in Dubai. Chua Guan-Hock, a director of the developer Khor Joo Saik Sdn Bhd attributed the win to the board and consultants who worked hard as a team. "This award is extremely meaningful and a stamp of approval of the tower's outstanding sustainability, as a market leader in Malaysia and the Asia Pacific region. Competing and winning against outstanding developments adds to the satisfaction of this acknowledgement," Chua said. Menara Binjai, a 35-storey green office tower, located right next to Ampang LRT station, is the first dedicated officer tower in Malaysia to be awarded dual green certification - Malaysia's Green Building Index Design Assessment for GBI Certification and a Green Mark Gold CerPficaPon (Provisional) by Singapore's Building and Construction Authority. The office tower was completed in July 2012 and new tenants, which include the British High Commission have already begun moving in. Menara Binjai's energy-efficient operations through the materials used and features allow up to 25 per cent savings on electricity and air-conditioning consumption. Cityscape Awards reward excellence and celebrate outstanding performance in real estate and architectural design across emerging markets globally. Regions and countries considered emerging markets are Asia Pacific (excluding Japan, New Zealand and Australia), Middle East, Turkey, Russia, Africa and Latin America. KUALA LUMPUR: Glomac Bhd is looking to increase its landbank to further expand its property development business. "Currently we have about 1,000 acres in landbank and we at constantly looking at opportunities," said group managing director Datuk FD Iskandar after the company's AGM on Tuesday. He said the company had gone through a few economic cycles and it was now on a new growth plane. "Our unbilled sales figure will improve with the RM1.1bil in GDV launches in financial year 2013," he said. HOMEDEC is celebrating its 10th successful year with more attractive offerings for visitors. The exhibition that gathers all renovation-related needs under one roof will be held over two consecutive weekends at the Kuala Lumpur Convention Centre. The first part themed Design and Renovation is from Oct 18 to 21 while the second part on Furnish and Decorate will be from Oct 25 to 28. It features 1,500 exhibition booths set up by over 430 leading companies in the home industry, the exhibition space is spread over six halls. Homedec organiser, C.I.S Network Sdn Bhd president Vincent Lim said the exhibition had further boosted awareness on interior design among Malaysians. “When we started the exhibition 10 years ago, our study showed that less than 50% of homeowners would engage interior designers when they needed to renovate their homes. However, our latest study showed more than 70% of homeowners would do that now,” he told a press conference in Kuala Lumpur recently. “Homedec is the platform to meet face-to-face with industry experts or to gather the know-hows about renovating and decorating your homes. The industry players are all here,” he said. He added that this year Homedec had been pushed a notch up with the introduction of the Urban Loft concept exemplified by a show house designed by award-winning interior designer Lai Siew Hong and his team from Blu Water Studio. “Homedec also plays a role to introduce future trends and new lifestyles to homeowners. With that, we also hope to stimulate the industry to come out with better designs and products,” he added. Lai was the winner of the Malaysia Interior Design Awards (MIDA 2011) the Residential Category of by the Malaysian Institute of Interior Designers (MIID). He and his team also won the Design Excellence for Show Units (Residential) Category in MIDA 2011. “Loft is a concept popularised in New York and London where warehouse space was converted into residential units. Moving on, Urban Loft is a space where function and aesthetics merge, we hope it will become the foundation for the future of the urban community,” Lai said. “The 600 sq ft show house constructed on-site is a seamless open space. It is small but compact, and it meets all living needs,” he said, adding that the Urban Loft will sport a night ambience in the second part of the exhibition. Lim said they were partnering with MIID for MIDA where the Homedec award will be bestowed to the winner of the Residential Category. The award comes with an air ticket to Milan. Part 1 of the exhibition features the ID Showhome where 10 interior design firms showcase their works, while Part 2 provides the opportunity for visitors to experience sights and sounds in a custom-built home cinema. The Homedec Quality Award and the Good Design Award are also at stake to reward products of excellence in an effort to raise the standard. The underprivileged are not forgotten, too. The Homedec Care Programme will bring better and improved living condition to the Shelter Home for Children (3). Visitors also stand a chance to walk away with cash prizes with a minimum purchase of RM100 in single receipt. A total of RM80,000 is up for grabs, RM10,000 will be given away daily. The exhibition is open to public for free. The opening hours are from 10am to 8pm. For details, call 03-7982 4668 or visit www.homedec.com.my or www.facebook.com/homedec.exhibition. KUALA LUMPUR: Tradewinds Corp Bhd said it has exercised the option to enter into agreements with Northern Gateway Free Zone Sdn Bhd and Benua Perdana Sdn Bhd for the exchange of the Malay reservation status of several pieces of land for a total consideration of over RM28.7 million. These lands, measuring more than 40.5ha, are calculated at RM5 per sq ft.
“The proposed land status swapping exercise is initiated to enhance the value of the lands involved in the exercise,” said the company in its filing to Bursa Malaysia. KUALA LUMPUR: The Government is already conducting feasibility studies on the construction of the second and third mass rapid transit (MRT) lines and will make the decision on the lines in early 2013, said the Performance Management & Delivery Unit (Pemandu’s) director of urban public transport & greater Kuala Lumpur Datuk Ahmad Suhaili Idrus. He said the second line called the ‘Circle Line’ was an orbital line around the main Kuala Lumpur city while the third one was quite similar to the first line (the Sungai Buloh to Kajang line). “The routes for the third line are shifted a little bit north and runs from Selayang to Seri Kembangan from the northwest to the southeast trajectories,” said Ahmad. He said the MRT mega-project was aimed mainly at “decongesting traffic in Kuala Lumpur” as there were too many new cars on the roads. “The number of new cars that enter our roads every year is about half a million. There are also nine million motorcycles. “This is a very big number to cope with and no amount of new highways can cater for all new (vehicle) registrations every year. “That is why we need a significant increase in rail capacity to achieve the 50% public transport (ridership) share in 2020,” he said. He admitted that today’s public transport ridership levels at around 17% was “very low” compared to other cities such as Hong Kong at 87% and Singapore at almost 60%. “The MRT project is the largest infrastructure project that this country has ever undertaken. The last big one was the KL International Airport. “The first 51km-long line from Sungai Buloh to Kajang will cost around RM38bil,” he said at the GCC-Malaysia Trade Investment Forum 2012. He said whenever a new highway, high-speed rail or a new MRT line was built, properties along the alignment would appreciate as people liked to live near public transportation terminals “so that they do not have to drive to work,” which was apparent in most developed countries. He also said the government was also seriously considering the high-speed rail link between KL and Singapore. “These are very high speed trains and depending on the design (of the trains) the speed range is from 350 km/h to 450 km/h but we will probably start with the lower (speed range) one. It is very efficient and can also reduce the travel time to between 2 and 2.5 hours. “This is nothing new, as countries such as Japan, China, Taiwan and in particular Europe have so many of them. This is a project that will transform the way people travel between KL and Singapore and it will benefit both countries immensely in the longer run,” he added. Meanwhile, International Trade and Industry Deputy Minister Datuk Mukhriz Mahathir said in his speech at the same function that the signing of the Malaysia-GCC (Gulf Cooperation Council) Framework Agreement in the areas of economic, commerce, investment and technical cooperation early last year would eventually pave the way for a Free Trade Agreement between Malaysia and the GCC sooner rather than later. Mukhriz, who officiated at the function, said that areas such as Islamic finance, property development, infrastructure and education could be investment opportunities for both Malaysia and the CGG countries.